Price per unit varies by color. 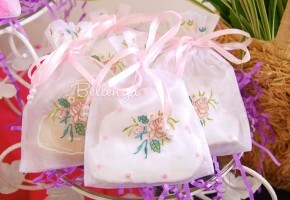 Sold in a set of 3 bridal shower sachet bags. Stands about 3″ high (excluding the handle). Bag opening measures about 2”. Constructed of silky satin fabric. Embellished with hand-rolled organza and satin roses. Handle is made from intertwining pearl strands. Ties closed with pearl-ended satin drawstrings. Available in white, pink, and lavender sachet bags. Ideal for a Tea Party, Valentine’s theme, or Vintage Wedding. Sold as a set of 2 favor trays. Crafted from a single natural shell, with a pinkish and ivory-hued interior. Measures 4″ from side to side. Its rim is finished with a gold trim. Embellished with tiny shells and swirly shell fragments. Each favor tray stands on three gold-toned balls as feet. Pair this trinket dish with the Anaïsa Seashell Place Card Holder. Perfect for a Caribbean, Luau, or Beach tablescape. These handmade seashell dishes are perfect as small gifts for guests. 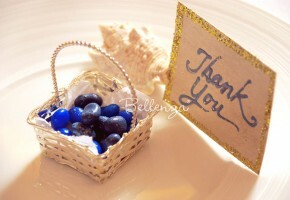 Present your guests with seashell candies or cookies in this trays. Sold as a set of 4 floral sachet bags. Stands about 4 ½” high (excluding handle). Has a 2 ½” diameter base. Made from fine silk fabric in an elegant ivory color. These floral sachet bags have handpainted watercolor flowers. Embroidered with metallic Lurex® yarn. Has ivory satin drawstrings with metallic thread trim. Ideal for packaging jewelry for bridesmaids, brooches, and fashionable pins. Popular for garden themed events. Sold as a set of 5. Measures 2 ¾” high (including handle) with a 2″ x 2” top opening. Made of metal strips woven into a dainty basket weave pattern. Has a gleaming silver-plated finish. Has a braided wire handle. Ideal for Easter weddings and beach receptions. 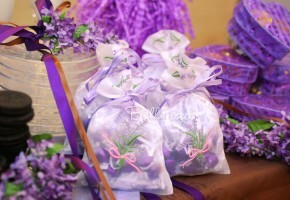 Sold as a set of 5 empty organza bags with an embroidered lavender bouquet. These are unfilled favor bags. 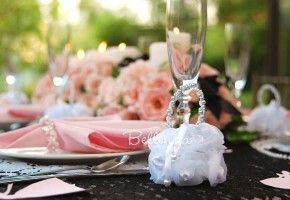 Each organza bag measures 5″ by 7″. Sewn from sheer organza fabric. Hand embroidered with a lavender sprig design. Finished with lilac satin drawstrings tipped with pearls. Great for bridal showers, gift baskets, and scented items. Get 25% OFF (on more than 1 set) with CODE: FIOV25. Made of high-quality sheer organza fabric. Embroidered with pretty rose and floral accents. Finished with pearl-tipped pink satin drawstrings. These empty embroidered favor pouches are perfect for holding edible or scented items. 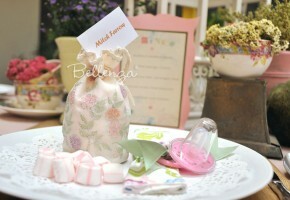 Great as bridal shower favors or for an afternoon tea party. Sewn from fine organza fabric with a sheer finish. Embroidered with a pretty ivy leaf and vine design. Sage green drawstrings are finished with pearl ends. Ideal for holding small gift items and edibles. 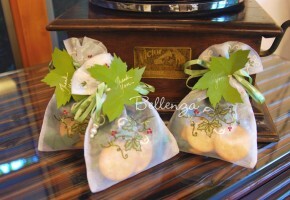 Popular as Italian favors, bohemian garden, or fall weddings.